My obsession with puff pastry has taken a new savory turn. Pretty sure that my last dinner dish request would be pizza, in a very predictable and cliché manner. I want pizza in any and all forms and especially for breakfast. My unsophisticated palette is like, okay, pizza all the time, every day. I really don’t get sick of it. Is that embarrassing? Do I sound like a 15 year old boy? Maybe. Breakfast pizza isn’t a new thing here. 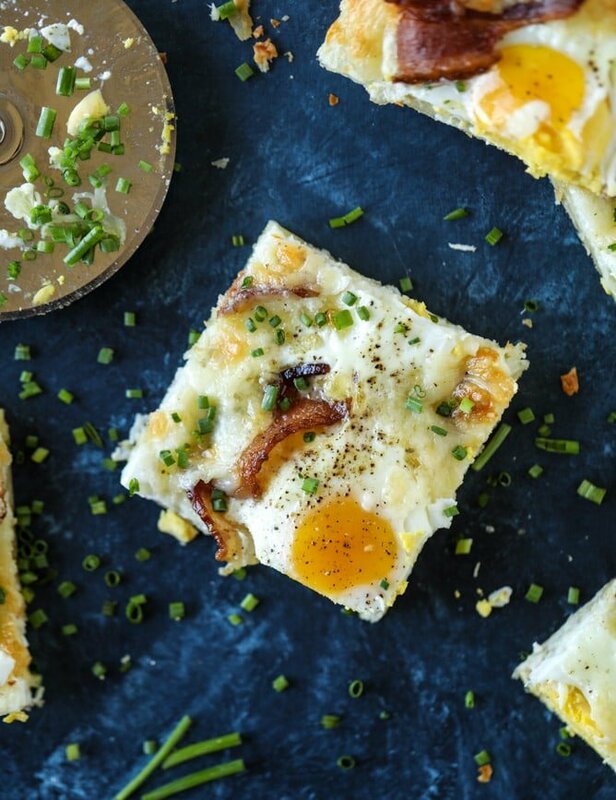 My all-time favorite is this burrata breakfast pizza and OH MY WORD is that stuff good. It is absolutely to die for. Burrata on pizza is innnnncredible. But what it probably comes down to is that I just really love eggs on pizza. Saying it like that sounds semi-gross, but what I mean is just crack an egg on top of my pizza before throwing it into the oven. It’s dreamy. That yolk is SO delish. So! 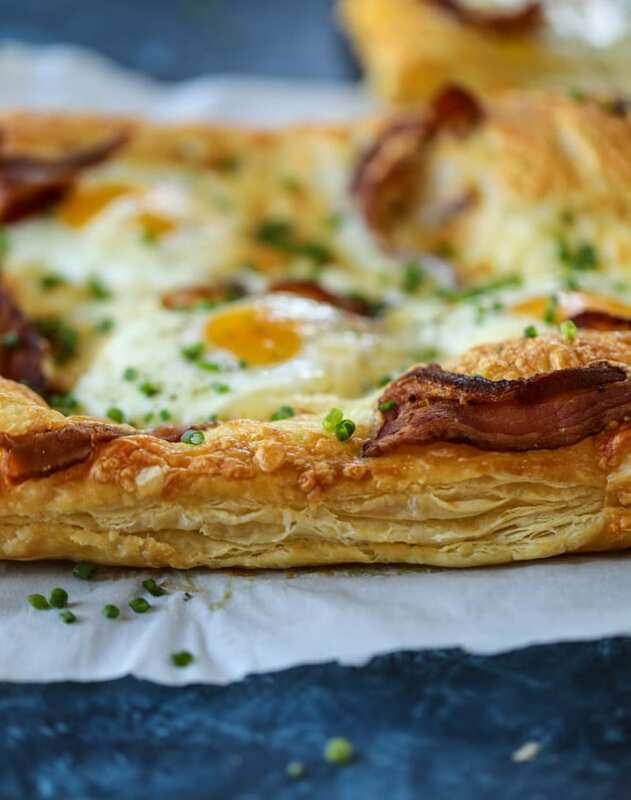 Puff pastry breakfast pizza is now a thing. This is a super easy recipe that can be thrown together for a holiday brunch. Unfortunately, it’s not like a casserole where you can prepare the dish ahead of time (um, tater tot breakfast casserole anyone? ), but with the puff pastry, it’s super quick and simple since it’s not like you have to wait for dough to rise. Sharp white cheddar cheese! I can’t ever get enough. Havarti would be amazing too. Bacon bacon bacon. I like to crisp it up just slightly so it gets even crunchier in the oven. Some sort of green herb, like cilantro or chives! You could totally add sausage too, if you’re into that kind of thing. I am not, mostly because: fennel seeds. They are the worst. Ever. In the universe. The puff pastry crust is just my favorite thing ever because it’s crispy on the outside but light on the inside and so flakey. It’s like a giant slab of faux-croissant and then we put breakfast things on it. Even if you don’t want this for breakfast or brunch, holiday time or not, it would make an awesome quick dinner that feels slightly fancy on a weeknight. 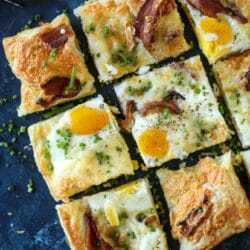 I really love to make this pepperoni pizza on puff pastry crust and this is the breakfast version of it. 6 large eggs or as many/few as you'd like! Preheat the oven to 425 degrees F. Set the puff pastry out to thaw if it has been in the freezer. Heat a skillet over medium-low heat and cook the bacon. You can chop it up to cook quicker or your can fry it in slices. You want it almost completely cooked - the fat rendered - but not burnt or crispy because it will still crisp up a bit in the oven. Place the puff pastry sheets on a baking sheet lined with parchment paper. Very slightly roll up the edges of the pastries to create a big of an edge for the crust. 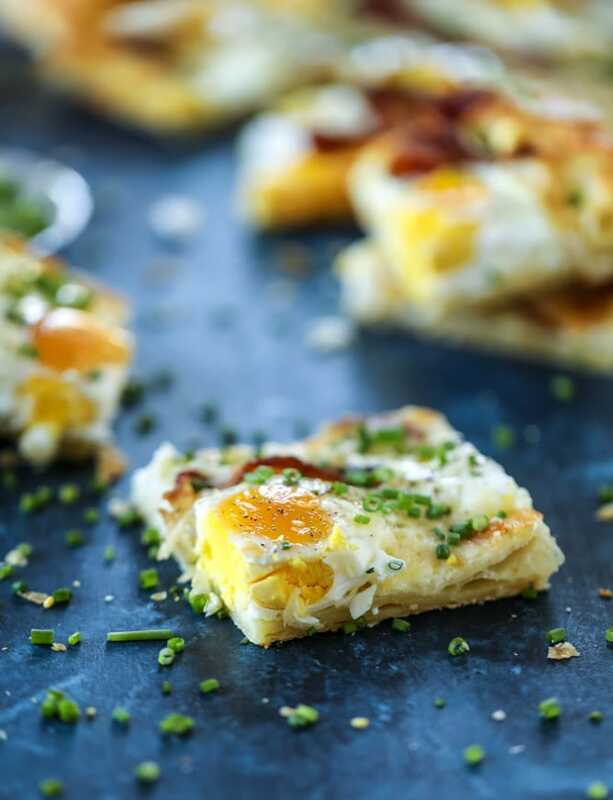 Brush the eggs with the egg wash.
Sprinkle the grated cheddar over both pastries. Add on the bacon, whether it's in slices or chopped. Crack each egg separately into a bowl, then gently pour it onto the pastry. Sprinkle everything with black pepper. 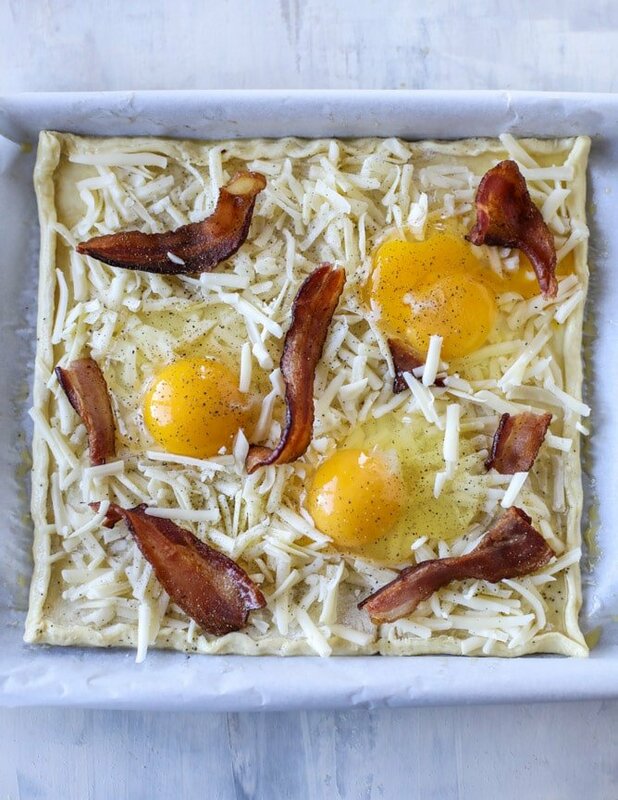 Bake the pizzas for 20 to 25 minutes, or until the pastry and cheese are golden and the eggs are set. Remove the pastries and sprinkle them with chives. Slice and serve! This can serve two people as a whole meal, but if it's part of a larger brunch or breakfast spread, you can serve four+! I was just searching breakfast recipes! This sounds delightful. I have never made puff pastry but this sounds easy and delicious. Thank you for sharing! Yesss! I’ve made 1000s of pizzas but never on puff pastry! Great idea!! I really don’t do enough with puff pastry. In fact, I don’t remember the last time i bought a box. It’s been a while. Thanks for the inspiration, Jessica! i loooove it so much! I LOOOVE breakfast pizza. Never made it on puff pastry, but I’ll definitely have to try it because this looks awesome! This looks delicious! But what am I missing regarding the serving size? There are 8 slices bacon, 6 eggs, 6 oz. cheese and puff pastry. That seems like a huge amount of food for one person as a meal! Holy Puff Pastry + Pizza! This looks phenomenal! Printing and drooling! not gross, love eggs on this! And love burrata too, but that’s another recipe, have to give you a big thank you for this savory breakfast, love the bacon too! Love this!!!! Can’t wait to make it!! You have so many good recipes I don,T which ones I should make first. Beautiful photos!! Are you making two separate pizzas. At first, I thought you would layer the two slices of frozen dough. Thanks!! yep! two separate pizzas, just to make enough for a crowd! It looks really very delicious and healthy. Keep sharing and caring! I bought two boxes of the fabulous all-butter puff pastry from Trader Joe’s last month without a plan or recipe in which to use it. And then this recipe came along. I neglected to get the white cheddar so I used fresh mozzarella, feta and parm. It tasted like so much more than the ingredients and look forward to making this again as a regular brunch recipe. Fantastically easy yet wonderfully delicious to eat. Highly recommend. Ive never come across a blog with so many pizza variations! I can’t wait to try this! I made this for an easy Christmas Morning breakfast and highly recommend it. I used some breakfast sausage instead of bacon. Try not to put your eggs too close to the side unless you want some overflow, but that part is still delicious! Making it now! Great idea! I am using sausage, bacon and grilled onions! !